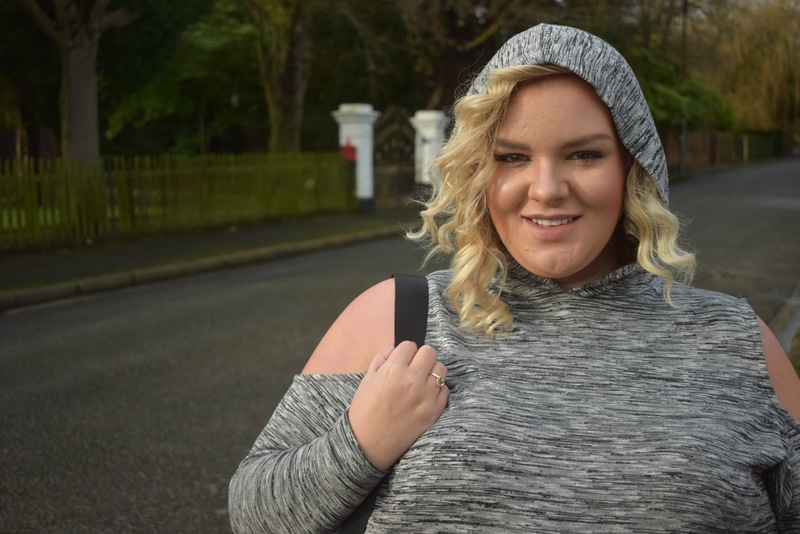 Feeling Body Confident & Rocking Sports Luxe At Any Size! When you’re self employed and work from home, its easy to want to stay in your PJs all day; trust me, that’s been a long running standard for me. However this year, I’ve been really making an effort to get myself some loungewear and I’ve found that the routine of getting up and getting ready as though I was going out to work has really helped my productivity. Of course there’s one exception; loungewear is far comfier than the suits I have to wear when I actually go out for meetings! I’ve been loving the sports luxe trend since last year now, ever since I really properly got into the gym. 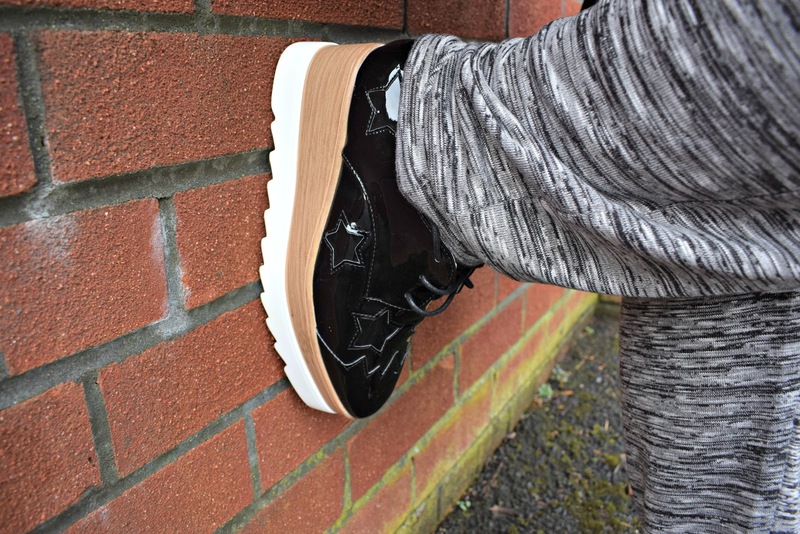 There’s loads of loungewear pieces out there that fit the sports luxe look really well and are perfect whether you’re at home, running errands or lightly exercising. A couple of pieces that I bought at the beginning of the year are the grey space dye cold shoulder hoodie and the grey space dye tapered leg trousers, which are sold separately so you can mix and match them with other pieces or buy them together for one complete look. Since my Simply Be order arrived, I’ve never had them off. They’re not going to win any awards for the most figure flattering pieces on my body but I love the way they make me feel when I wear them; comfortable, relaxed and ready to be productive whatever comes my way! On casual days, that feeling is worth far more to me than worrying if you can see my tummy and jiggly bits through my clothing. It has taken me a lot of years to become that body positive about my shape and size but I cannot tell you how great it feels to love your body inside and out. It gives me the body confidence to wear whatever I want and feel great in it. I can pull them on after my morning shower and skincare routine and go about my day knowing that I look somewhat put together. Whether I’m working at my desk, answering the door to my favourite man (the postman), popping to the shops or taking my Bichon Frise for a walk around the park, they’re the perfect co-ord to wear. 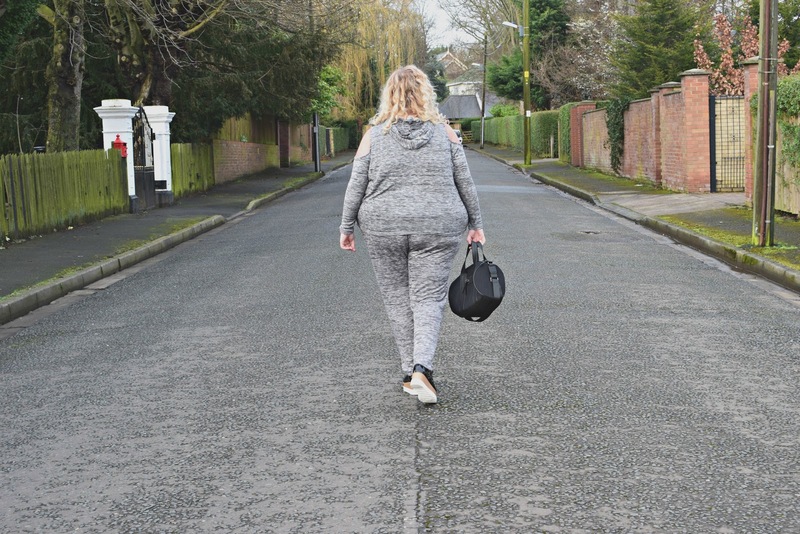 I must admit that I do find the fit of Simply Be clothing to be very hit and miss but these are a very accurate size and the slouchy style combined with the stretchy material and drawstring waist on the trousers makes them very easy to wear comfortably regardless of your shape and size. The super soft fabric also washes really well time and time again (lets face it ladies, that’s an important factor!) which is ideal for me as I’ve worn them so frequently. 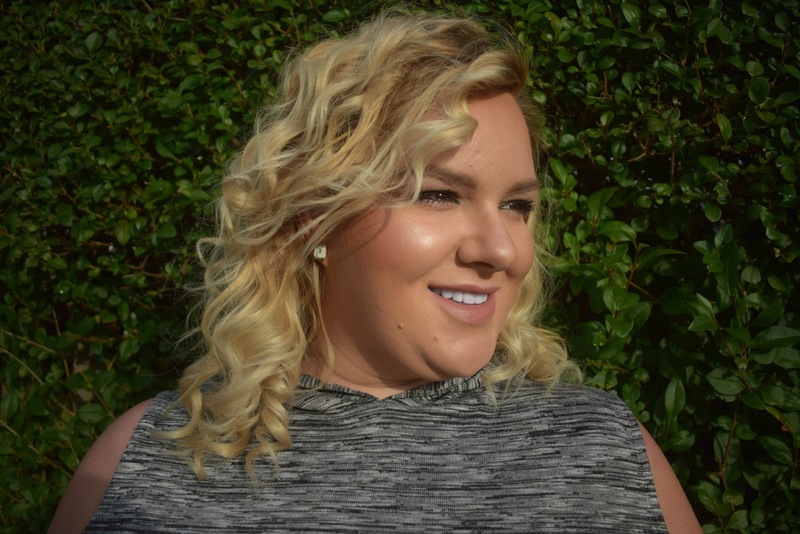 I used the Lee Stafford Chopstick Styler to achieve this hair look; check out my blog post on it! Now I know we all know how much I love my designer bags but how incredible does this black duffle look? 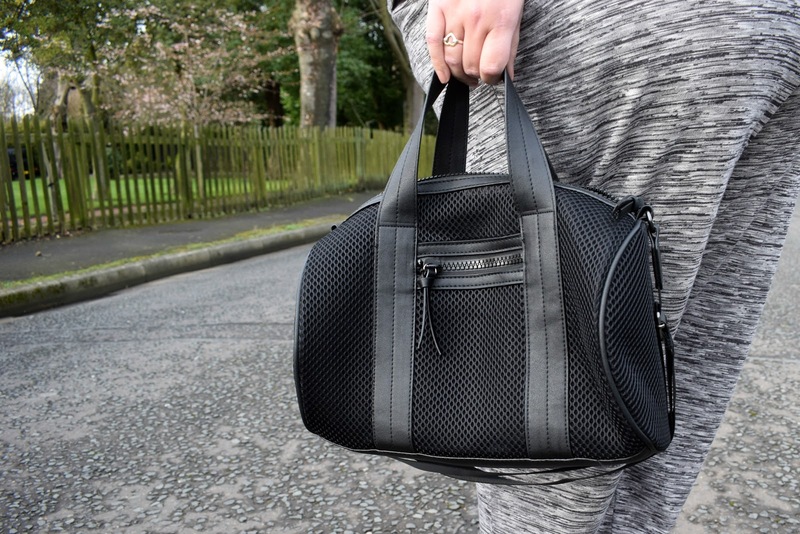 I love the stylish mesh detailing and while I originally bought it to keep my things in for the gym but its actually perfect for day to day use. What is even more perfect is that it was ONLY £7 from Primark. I used to find that Primark bags looked really cheap and plastic but they’ve really upped their game recently. This bag looks far more expensive than the price tag and I think it may be because of the lack of leather effect material which often seems to cheapen the look of their bags. So many people have complimented me on this piece and asked where its from… I’m almost tempted to go back for the khaki version to keep for the autumn time! 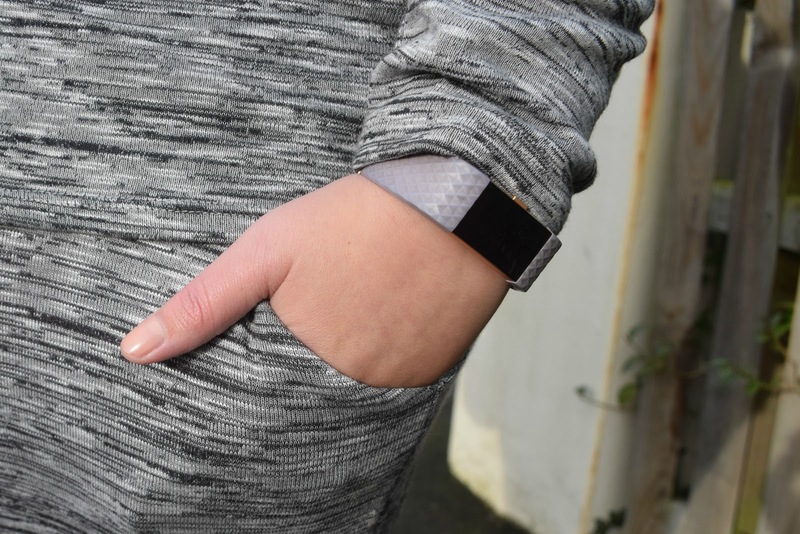 The other must have that you’ll see me wearing in this post is the Fitbit Charge 2 HR Monitor which I’ve rarely skipped a day wearing since I bought it back in November. If you’re working towards fitness goals, looking for motivation to be more active, trying to hit our calorie burn or looking to improve your sleep then it is the best investment you’ll make. Working from home and especially online, I find myself sitting down being sedentary a lot so wearing a Fitbit has really helped me to be more consciously aware of my activity levels each day. Plus, I sleep badly so being able to track and make improvements has helped me so much! I have the special edition with the rose gold and lilac strap and I really wouldn’t recommend this colour way because the strap discolours immediately as soon as its near any dark colours so I’d recommend going for the black or one of the other darker colours. On this occasion, I paired my co-ord with my gorgeous star platforms from CocoRichelle1. If you haven’t checked out her Instagram yet then you seriously need to as she has the most incredible stock. She has her own clothing and accessory lines that she sells as well as designer inspired pieces like these platform brogues that are inspired by the Stella McCartney Elyse shoes. Plus, she also works as a personal shopper so if you’ve been looking for a YSL bag but can’t find it in the colour you want, she’ll source it for you direct from luxury stores like Selfridges or if you love the style of River Island clothing but they don’t ship to you in your country, then she’ll head into store to purchase it for you and sent it to you. Totally genius and a great service for all of your MUST HAVE lusted after items! I have these shoes in the black and in the rose gold colour ways and they’re absolutely gorgeous; so comfortable but give me the added height that I really want. I walk taller and more confidently in them; don’t you just love it that shoes have the power to make you feel like that? I hope you’re all having a great week so far and that you’re smashing your goals, whatever they may be! I’m sat here typing this with a HUGE smile on my face because I’m so excited for the great things that life has got in store for me… Life is good when you do more of what makes you happy. What do you like to wear on casual days? Do you love the sports luxe trend too? 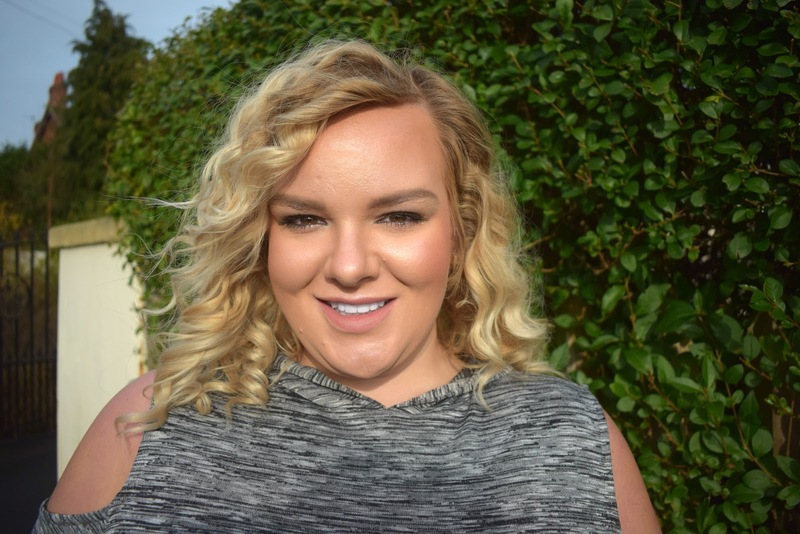 What makes you feel body confident? You look stunning. I seriously want a fitbit but unable to afford one yet. Keep going lady! Your Simply Be lounge suit looks so comfortable yet smart. Love the cold shoulders. That bag is a bargain for £7. How cute do you look in the hood!? I'm going through a grey phase at the moment and I love this! I'm living for the sports luxe trend atm. This look is incredible on you! Your shoes are so fab too! You inspire me! You rock babe! I live for comfy clothes as I work from home too. I really need two pieces like this. I tend to always wear gym pants! You look so stylish yet comfortable too 🙂 great outfit! Love relaxed and comfy sports gear and this one is a great style and colour. I love love love grey at the moment and I love spending my 'work at home' days wearing comfy lounge wear too! Ah finding the clothes for work from home is a big task for me and I do work in pyjamas too. I really love this lounge wear, the colour is perfect and you wore it so well!I wish I had a Fitbit or something similar but as a Fitness blogger, I am hopeful a brand will be kind to me one day and hand me one for free lol.I love your makeup Laura, did you do it yourself?